The number one rule in putting together a successful hunting trip is to plan ahead. Many a hunter has been caught short during a hunting trip by the lack of foresight and planning. Because hunting elk is considered to be one of the most challenging, putting together an elk hunting gear list can be rather extensive. However, if one is opting for a self guided elk hunt where there is no back up, making sure all the necessities are there is crucial. The outdoors is known for being fickle and unpredictable. Having the right gear can mean the difference between a successful trip and an all out disaster. The basics of a well rounded elk hunting gear list fall into the categories of food and water, shelter, clothing, tools and weapons, first aid and some miscellaneous items. Nearly everything brought on the trip will fall into these categories. Breaking a list down into these groups can help keep things orderly and make sure that everything is included before and after the trip. Getting recommendations from an outfitter or using a pre-made list is a helpful option, however, because preferences vary, there are no set rules of exact brands or product types that must be used. 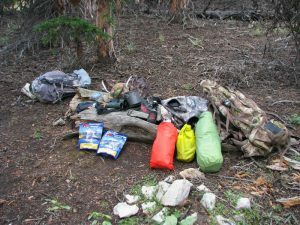 The seasoned hunter often has an idea of which things they want and need for their trip, using a pre-made list as more of an outline. While food on an gear list is open to preference, it should consist of simple and mostly non-perishable items. Shelter should include not only tents and sleeping bags but cooking gear, lanterns, chairs and table, utensils and a basin for water. Clothing should be weather appropriate with extra items for unexpected, extreme temperatures. Along with waterproof boots, gloves and heavy socks, one should pack extra clothing for after the day’s hunt. While bringing a weapon for hunting is an obvious necessity, bringing an extra two boxes of ammo is a minimum recommendation. A shovel, saws and even sharpeners are just a few of the tools needed on an elk hunt. Some of the most important items on a list are those for the first aid kit. A larger first aid kit consisting of blankets, splints or foldable emergency litter can remain at the camp. However, a smaller first aid kit that can be carried in a fanny pack or other small bag should be present on the hunt at all times. As many injured hunters out in the field have found, no first aid kit makes the trip back to camp just that much longer. Some other items one might include on their elk hunting gear list is a camera, scent free hygiene products and the universal fix all, duct tape.